Note on methodology: to the extent possible, all sources (documents, videos, photos, articles) used for this story have been listed on a separate Resources page for this piece. Most sources are embedded or included in links throughout. Other sources of information and corroboration include extensive interviews carried out with numerous participants in the events, freedom of information requests, and personal attendance at court cases. I was not based at Warwick campus during these events, having been on a year abroad in Melbourne, Australia. 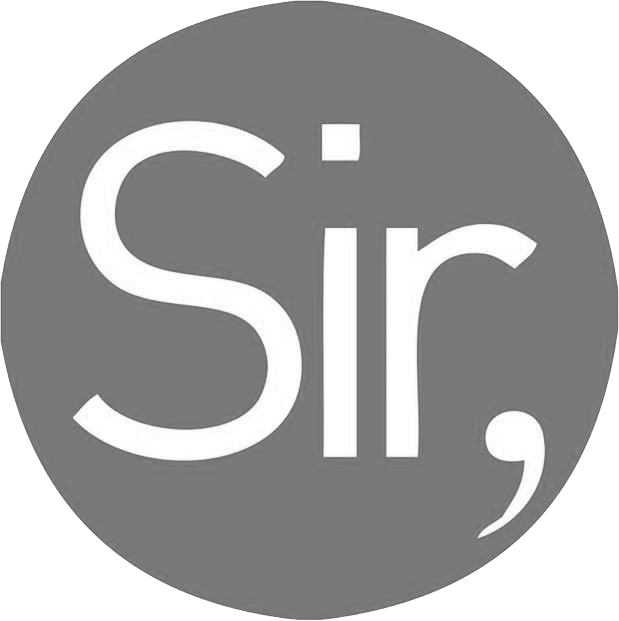 Note on pronouns: The pronouns used to refer to individuals throughout this piece are those preferred by the interviewees. As such, non-binary pronouns like ‘they’ and ‘them’ (to refer to an individual), and ‘zhe’ and ‘zher’ are sometimes used. December 3, 2014. Senate House, University of Warwick. “What’re you doing? !” shrieks a female protester as a policeman grabs the camera strap around her neck and pulls her sharply to the floor. A fellow student steps towards her in response, and is shortly met with a blast of CS gas into both eyes. Behind them, chaos is ensuing: a melee of around 25 students, security guards, and police. Students scream in fear, security guards haul protesters out of the building, and a police officer activates the emergency distress button on his radio device for only the second time in his career. 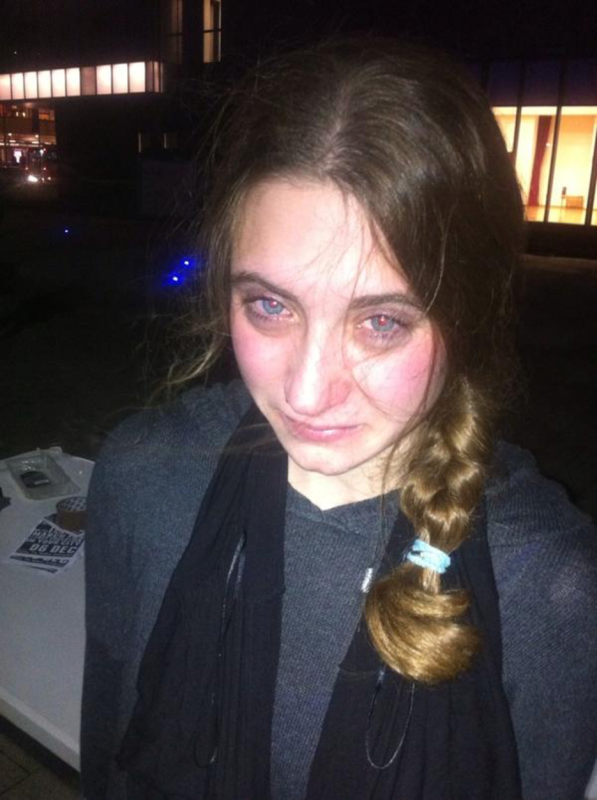 Figure 1: Anna Rivers, 21, who was sprayed with CS gas as she crouched down to tend to a friend who had been thrown to the floor. One man is forced onto his back, crushed under the weight of a police officer’s knee. A cry for help escapes from his lips. Instinctively, a friend runs towards the man calling for help. They are slammed to the floor by a security guard. A man and a woman crouch down to help – and are met with a second blast of CS gas. One cries out and turns away, falling to his knees. The other clutches her face. “First you just feel wet on your face, like you’ve been splashed with water […] Then it starts to burn, so you’re crying, you rub your eyes and it makes it worse. Your whole face is stinging, you can taste it your mouth, you’re coughing a lot, it’s difficult to breath. You’re crying so much you can’t see,” describes Anna Rivers, one of the two victims of the second spray. “All back off or you will get CS’ed,” bellows the policeman who has just sprayed three people. Then comes the noise that will haunt several of the protesters for months to come: the cracking and sparking of a police Taser, arced in the direction of the adrenaline-filled crowd. Figure 2: PC Lloyd, left, holds CS canister in right hand. PC Horton, right, puts Taser on warning mode. The mood changes. Through air thick with CS gas, emerge Warwick for Free Education; no longer merely a collection of individuals with a shared intellectual outlook, but also a shared experience of police brutality. Three are carried into police cars that night, arrested for assault and public order violations. Shock, terror, bewilderment. These are a few of the adjectives that would subsequently be used to describe the feeling of the students that day: on social media, in interviews – and in court. The events of Dec. 3, 2014, on the University of Warwick’s campus, have caused endless controversy and confusion. Through a painstaking analysis of online and video content, examination of dozens of witness statements, eleven in-depth interviews, and comments from a range of participants and actors in the occurrences, the Warwick Globalist has reconstructed the sequence of events. A detailed timeline is listed on the Resources page for this story. What followed for the rest of year was a concerted attempt by Warwick’s administration and the West Midlands Police to subdue the protest movement on campus. A High Court injunction was taken out, the University took three people to court, and an attempt was made to turn one Warwick student into a police informer. Warwick would see the largest protest in its history, the University would gain notoriety across the country, and mental health issues among campaigners would be exacerbated. Only now are we in a position to put the whole tale together. Certain aspects of the events on Dec. 3, however, remain unclear. Alastair Robinson – who is not a Warwick student – would later be charged and eventually convicted of assaulting Peter Wyld, a security guard with the external company Atlas. The evidence against him consisted predominantly of the testimony of Mr Wyld himself, as well as a fellow Atlas security guard. The fact that Alastair changed clothes after the alleged assault was also described as “the action of a guilty man”. The University refused a Freedom of Information Act request to release the CCTV footage, “on the basis that the CCTV footage contains substantial third party data”. Every protester who was interviewed maintains that the assault was either fabricated or grossly exaggerated. Mr Robinson is appealing the sentence. What is clear, however, is the behaviour of the police on Dec. 3. What really happened that day. The day in question began at 3.30PM with a rally around the Koan, near Senate House. The rally was part of a National Day of Action called by the National Campaign Against Fees and Cuts (NCAFC), with which Warwick for Free Education (WFFE) is loosely aligned. The purpose of the rally was to pressure the University administration to publically advocate free education and reject the Russell Group’s lobbying for a £16,000 tuition fee regime. Around 35 protesters were present, and a banner was dropped off the Arts Centre roof during a series of speeches. At around 4:00PM, a collective decision was made to stage a non-disruptive sit-in in the foyer of Senate House. Four people originally gained entry (during this time Alastair Robinson allegedly assaulted one of the Atlas security guards attempting to prevent the protesters from entering, Paul Wyld), followed quickly by seven more. After trying to seal off the building following the entry of the first 11 protesters, Mark Kennell, head of Warwick Security, decided to allow free access for the remaining 20 or so activists standing outside. After a brief chant, chairs were pulled up and a discussion on free education commenced. The mood was calm – one of those present would later describe it as “quite a boring discussion”. Half an hour later, the flickering of blue lights disrupted the darkening evening and illuminated the foyer. The calm evaporated, replaced with confusion and trepidation. Mark Kennell had responded to Paul Wyld’s allegation of assault by calling the police. “The mood changed quite a lot. We became tense and curious, but we didn’t think they were for us,” says Charles MacDonald, a member of WFFE who participated in the sit-in. Most – perhaps all – of the protesters had no idea why the police were there. Ian Hopkins, a member of Warwick Security, informed them that they were tending to “an unrelated incident”. Mark Kennell initially attempted to talk to one of the protesters, Miguel Costa Matos, about the police presence. Miguel refused, on the grounds that Mr Kennell could address the group as a whole, or not at all. No other efforts to communicate with the protesters were made that night. This cursory attempt at communication having failed, the six police officers entered Senate House. The sit-in ended; everyone was standing. The main group linked arms, responding defensively to the unexplained police presence. “You’re not allowed to be here,” Jonathon Pitt, a member of WFFE, called out to the police. “Oh I think I am,” responded a uniform-clad police sergeant. The protesters repeatedly asked the police why they were there, to no response. After a brief, inaudible consultation with security guards, two police officers “piled in” to the rear of the crowd. “It wasn’t clear what they doing or why … they were surrounding the group,” recalls Charles. From then on, “it was an absolute mess,” he says. Naturally for a group that associates with the national ‘Cops off Campus’ movement, members of WFFE didn’t take this seeming act of aggression by the police well. Some passively resisted the encroachment by linking arms and standing their ground. C Lloyd, 0796, was particularly violent. Videos show that he had taken out his CS gas canister within moments. Initially, he grabbed Lorenzo Feltrin, a PhD student who was on the outskirts of the main crowd, forcefully by the neck. Figure 4: Lorenzo Feltrin (left) being grabbed around the neck by PC Lloyd. Mark Kennell, (centre, black coat) watches on. As this happened, Callum Cant – perceived as one of the leaders of the sit-in by management – was dragged out of the building by security guards. After throwing Lorenzo further into Senate House, PC Lloyd returned to the main zone of confrontation. Looking around for a few seconds, he settled on grabbing Hope by the camera strap around her neck, as she filmed the melee between students, security, and police. The Warwick Globalist has obtained exclusive video footage of the incident from Hope’s camera. “As far as I’m concerned, that was a total outburst of aggression because … I was just standing and filming – but I think police officers really don’t like it when you film them, which is, you know, not a coincidence,” she says, reflecting on the events. As Hope was on the floor, Lawrence Green stepped forward, seeking to protect her from the unprovoked aggression displayed by PC Lloyd. After a momentary standoff, Lloyd took his CS canister from behind his back and fired it into Lawrence’s eyes. 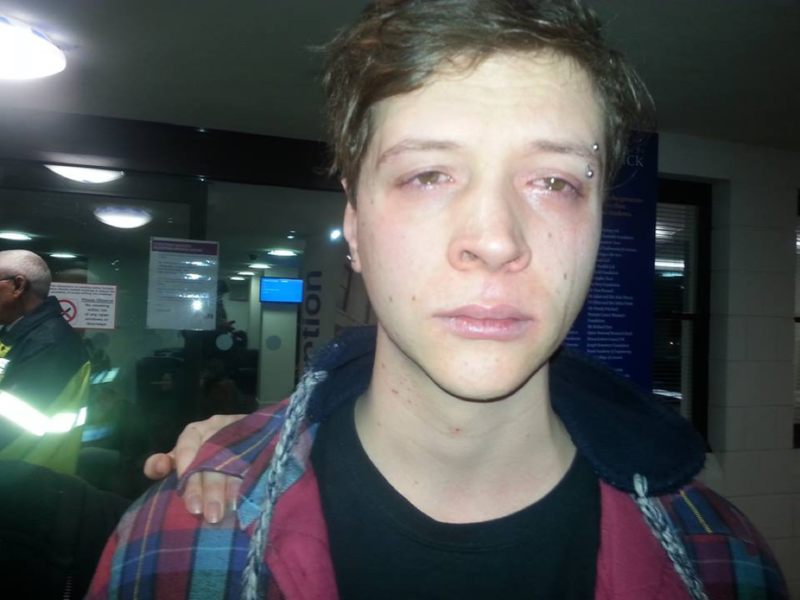 Figure 5: Lawrence Green, who was sprayed with CS gas after stepping towards a friend who had been dragged to the floor by PC Lloyd. Whilst CS gas was being used in the foyer, Alastair Robinson had been pushed into the Post-graduate Hub and was being subdued. 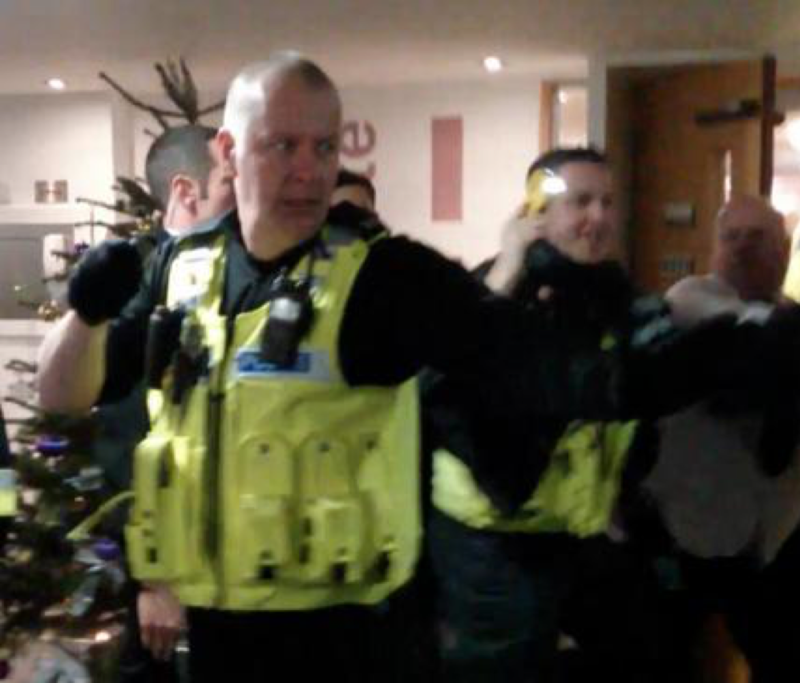 Despite a subsequent Tweet to the contrary by West Midlands Police, PC Barratt pointed a Taser at Alastair. A Taser was also pointed at Daniel Dawson, after he too was dragged into the hub. This is confirmed in the witness statements made by three of the police officers present. At this point, Alistair cried out for help. Instinctively, a friend of his, Luke Dukinfield, headed towards the PG Hub to see if he was okay. “Alastair was down the corridor, and we could hear him shouting. We still had no idea what was happening, but I could hear him shouting basically ‘help me!’ ... so everyone was very concerned for him, and Luke essentially went to try and get to Alastair,” Hope describes. Following the drawing of the Taser – which was threatened, but not used – the police moved to arrest Daniel Dawson, who was accused of attempting to obstruct Alastair’s arrest by “bear hugging” him in the initial stages of the confrontation. As the police attempted the arrest of Daniel, Luke again moved protectively towards him. They were rapidly taken to the floor once more. At this point, Lorenzo and Anna bent down to see if Luke was okay. PC Lloyd immediately sprayed Lorenzo with CS from the side, bypassing his glasses. Anna, crouching to the right of Lorenzo, was indirectly hit by the spray. Only then does PC Lloyd warn the crowd to “all back off or you will get CS’ed”. In his written submission to court, Lloyd claims that he issued clear warnings to the protesters prior to activating the CS gas. There is no evidence for this in the video recordings, and it is denied by all the protesters who were interviewed. West Midlands Police would later say in a statement that CS gas was only deployed “when a group [of students] advanced on officers”. This, as confirmed by video footage and testimony, is false. For the Coventry Magistrates Court Judge, all protesters were guilty that day. When reading out his final statement, the judge looked pointedly at the back row of spectators – many of whom were WFFE members who had been present on Dec. 3 – and told them that they were lucky they hadn’t also been arrested that day, because he would have convicted them too. Outside Senate House, police vans equipped with riot shields had arrived; a police dog was deliberately made visible. After indicating some intent to arrest Callum Cant, the superior officers could see the confrontation had passed and their presence was further antagonising students, and ordered their subordinates to rapidly leave campus with Alastair, Luke and Daniel. Quickly, it dawned on the protesters that they needed to get the news out. A media room was set up in SUHQ, and video footage uploaded. It didn’t take long for the scenes to go viral. The next day was a historic one for activism at Warwick. Never, from the first rally on campus in 1967 against the presence of the US Ambassador, had so many gathered to protest something so virulently. Between 700 and 1,000 attended the ‘Cops off Campus’ demo on Dec. 4. Following an evocative speech by an officer at Birmingham’s Guild of Students, Hattie Craig, the crowd moved to the back of Senate House and broke through the locked doors in an attempt to occupy the building. Finding a room full of police and security guards, the crowd moved instead to the Rootes Building, where 200 people entered before the University locked the building down. The Warwick Globalist has obtained exclusive footage of those events. 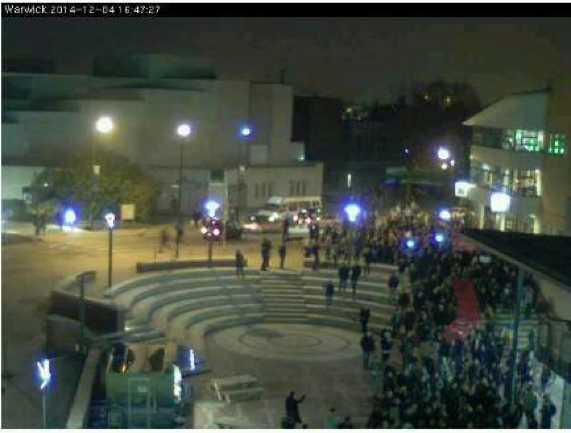 Figure 7: Photo from the Piazza web-cam recording the crowd as they headed to the Rootes Building. Walking up the Rootes Building stairs to the upper floor, students felt their collective inhibitions – so carefully cultivated by a culture of subtle control and management – rapidly falling away. Hundreds stayed for several hours working out a list of demands to present to the University, which included calls for the management and police to apologise, set up an independent investigation into the events, and bring in a security code of conduct. The University was given until Jan. 6, 2015 to respond. Ten months later, none of the demands have been met. 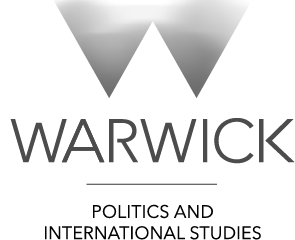 In response to questions, the University press team told the Warwick Globalist that a wider consultation into the security code of conduct was still ongoing. The occupation of the Rootes conference space would last for eight days, and inspire a wave of solidarity messages, protests and sit-ins. Statements of support flooded in from Manchester, Leeds and Durham. Activists from Defend Education Birmingham were present to assist WFFE from the first moment: arrestee support on Dec. 3, organisational assistance for the Dec. 4 rally, and attendance at the occupation. Defend the Right to Protest condemned the “extraordinary level of police brutality and violence”. 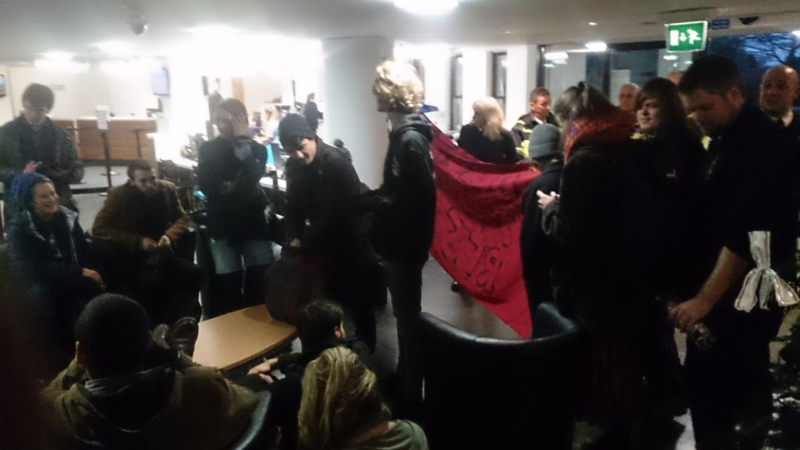 Students at SOAS, University of London, even occupied a local police station for an hour. Over 100 academics and researchers signed a letter protesting “in the strongest terms” the police actions, and calling on the University to “publically affirm its commitment to democratic values”. 3,000 Warwick alumni demanded the University issue an apology to those affected. The largest human rights organisation in the world, Amnesty International, raised “serious concerns about whether the police acted heavy-handedly and seriously endangered people at the scene”. Some also noted that the distance within which the CS gas was discharged was less than one metre, and thus seemingly in breach of police guidelines on its use. The Warwick Globalist repeatedly contacted the College of Policing, the national body which sets police guidelines for the use of CS gas, but never heard back. It seemed obvious that, as Nat Panda, Warwick SU’s new Postgraduate Officer says, “The police and security completely lost it that night.” Natalie Bennet, Owen Jones – everyone seemed appalled by what had occurred. Everyone except, it seemed, the University administration. Ever since the events of Dec. 3, the University management have remained unfailingly resolute in their refusal to condemn the police actions, and in their seeming attempts to discredit the protesters. The University’s position on events became clear even that night. As back-up police arrived Head of Security Services, Mark Kennell, walked up to Police Sergeant Johanna Comer and told her how he was “extremely impressed and pleased with the way the officers had handled themselves and controlled the situation”. Kennell wasn’t isolated in his response. On Dec. 4, Nigel Thrift, Vice Chancellor of the University, issued a statement which set the tone of what was to come. “For one thing, nothing had been proven at that point, but he took the assault to be gospel truth, and the CS spray – I don’t even think he mentioned it,” says Charles MacDonald, the afore-mentioned WFFE campaigner who was present on Dec. 3. Many students agreed. So strong was the feeling that on Feb. 6, 2015, a vote of no confidence in Nigel Thrift was passed at Warwick Students’ Union, with over 60% of students in favour. It remains official Union policy. During the occupation, management engaged in ‘negotiations’ with WFFE members. The members of the University management made it clear they had no interest in discussing the occupiers’ grievances. In the words of Head of Security, they “refuse[d] to negotiate with the group on their terms”. The administration also refused a request by Cat Turhan, then-Warwick SU President, that the University pledge to take no disciplinary action against the occupiers. Glover wrote a letter to the occupiers on Dec. 5 stating that the “the university has so far taken a measured approach and will permit food drink [sic] to be available,” suggesting that even such necessities might be cut off shortly. He requested that the occupants “cease your unauthorised presence immediately,” and made no comment on their demands. None of the recommendations have yet been taken up by the University, although Peter Dunn, the University’s Head of Press and Policy, stated that the University “has been examining students communications [and] has appointed a student communications officer to assist with that”. When asked why the management hasn’t offered an apology over the events, Dunn responded that, “The university [sic] has already said that it could have communicated more quickly at the time.” It’s unclear how this answers the many who have queried the lack of an apology. Nonetheless, the true attitudes of management were revealed when, following widespread pressure, the University agreed to participate in a ‘Protest Summit’ held by the Centre. The reaction of academic staff to the events of Dec. 3 was somewhat different to that of the management. The Centre for Human Rights in Practice’s survey found that 80% of academic staff who responded were “critical of the reaction to the protests”. 76% of postgraduate and 66% of undergraduate students expressed similar sentiments. Five days into the occupation that followed the ‘Cops off Campus’ demo on Dec. 4, the University administration stepped up its offensive. On the morning of Dec. 9 a hefty 150 page document was delivered to the occupiers. The first page: a court hearing for Dec. 12. The University was spending thousands to get a High Court injunction and possession order against the protesters. Hattie Craig and “Cakkum Cant” were the two named defendants. The misspelling of Callum’s name would invite ridicule and satire for months to come. An injunction is a High Court order which prevents particular individuals from carrying out certain acts that undermine the rights of the claimant – in this case occupiers violating the University’s right to private property, and causing it damage through the disruption of the Rootes conference space. A possession order establishes a claimant’s right to their land, and legalises the removal of anyone continuing to trespass on their land. Anyone remaining on the land in violation of the possession order can be subject to criminal proceedings. The named defendants – Hattie and Callum – were threatened with unlimited legal costs, which were dropped in an agreement signed between the occupiers and the University. The former agreed to end the occupation, and the latter agreed not to press for legal costs. In court, the final deal barred Callum and Hattie from ever being physically present in a future occupation at Warwick; if they were, the threat of legal costs could be resurrected. Figure 10: Map of campus showing the extent of the injunction order, and the exempt buildings. Occupations, which have been a feature of Warwick’s campus since the first sit-in in the Library in 1969, are now banned, with the legal weight of fines and imprisonment marshalled behind the prohibition. The injunction has garnered the contempt of many students. “The granting of the injunction was bad enough - for it to be indefinite, applicable to the entire campus, and unilaterally imposed on students in the absence of any attempt to investigate and respond to serious allegations made by both parties, was nothing short of outrageous,” says Alex Clark, a recently graduate PPE student. Management, for their part, described the court order as “a good investment because of the damage that’s been caused in previous occupations”. The University spent £12,558 on the injunction, not including legal advice costs. Ken Sloan, the University’s Registrar, estimated in the Summit on Protest that previous occupations have cost the University over £30,000. The force of the law was present in the aftermath of Dec. 3 in other ways. The three individuals who were arrested that night were given harsh bail conditions that were extended for months. One, Luke Dukinfield, is a Warwick student. Their bail conditions prevented them from seeing the two other defendants, and banned them from campus for anything other than scheduled lectures. Their role as President of Warwick Amnesty was essentially ended, and they weren’t even allowed to study in the Library. The Guardian revealed last year that Luke is one of at least 855 who have had their right to protest restricted by bail conditions since 2008. Luke wrote at the time about “the siege of worry levelled by the prospect of a prison sentence” that they felt as a result. Their anxiety severely worsened during the course of the year. “I felt so intimidated and so unwelcome I preferred not to go into campus. I didn’t feel particularly safe there,” Luke says. Due to the severe pressures generated by the bail conditions and court case, they are retaking their second year in Chemistry. Others who participated in the Dec. 3 protest were also traumatised by both the events and the University’s response. Several interviewees claimed they subsequently developed mental health issues, or experienced an exacerbation of pre-existing conditions, as a result of the police behaviour and University reaction. “The University have attacked me in a way that has severely damaged my mental health, and they’ve done the same for a lot of people involved in activism at Warwick,” related Callum Cant, one of the named defendants on the injunction. The injunction includes screenshots of his Facebook timeline as evidence against the occupiers. He was diagnosed with depression following the events of Dec. 3. Another negatively impacted member of WFFE was Jonathon Pitt, who was a third year philosophy student at the time. Zhe has had anxiety attacks related to the violence. Whilst Jon was visiting a market in Istanbul in June this year, a device gave off a sound reminiscent of the Taser that night. “I had a panic attack from hearing that sound again and I had to run out of the shop and cry for a few minutes,” zhe says. It’s not just the events of Dec. 3 that impacted people mentally. The looming fear of disciplinary action by a seemingly unsympathetic University administration also took its toll. “I got really bloody scared,” says Roya Esat, a now-graduated biomedical science student who was in Senate House on Dec. 3 and engaged in the subsequent occupation. Following Dec. 3, Roya “more or less retired” from student activism. “There were many occasions where I was working in the library … and I had anxiety attacks … These things effect you in ways you don’t even realise at the time,” she concludes. Miguel Costa Matos was similarly afflicted. “The next two weeks … exhibited the symptoms of post-traumatic stress, of reliving the moment in my head,” he says. One element of the struggle between WFFE and management has become a battle over the legitimacy of disruptive occupations as a tactic of protest. 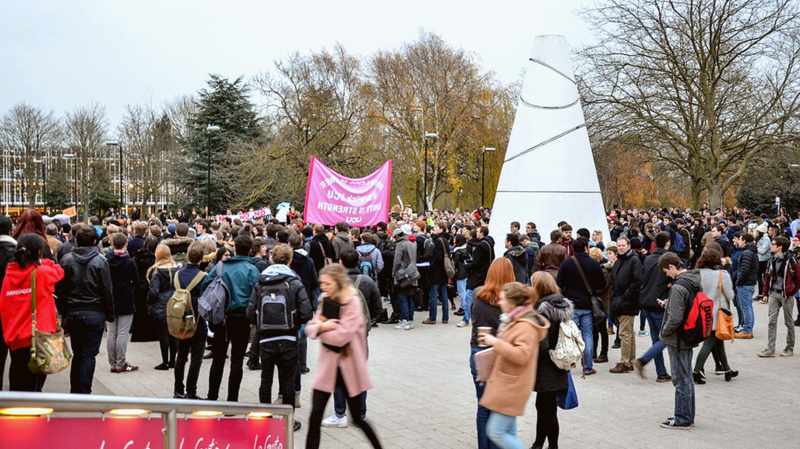 Whilst occupations have been used by student groups across the country for decades, the University of Warwick increasingly maintains that they are an illegitimate and unlawful form of protest. Jo Horsburgh, the University’s Deputy Registrar, called for protesters to “[allow] the University and its members to function in daily business,” and condemned WFFE’s previous attempts to “unlawfully occupy”.2 This is a clear message that disruptive occupations – designed to directly leverage the administration – are not going to be tolerated in the future. Such diametrically opposed views will likely generate direct confrontations between the two sides in the coming year. Members of the University management were all sent requests for interviews during the construction of this piece. Nigel Thrift, Mark Kennel, Ken Sloan, Michael Glover and Jo Horsburgh all received emails in an attempt to get their side of the events. All overtures were ignored. Only Peter Dunn, the University’s Director of Press and Policy, gave brief responses to the Warwick Globalist’s detailed questions. Ten students who were directly affected by the police violence on Dec. 3 submitted complaints to the Independent Police Complaints Commission (IPCC), the government’s ostensibly independent police watchdog, at the end of the month. The complaints levelled include allegations of assault and “oppressive conduct or harassment”. West Midlands Police initially launched an internal investigation, before passing it on to the IPCC. The IPCC give recommendations to the Crown Prosecution Service (CPS), which can decide to launch criminal proceedings against officers. However, for charges of assault – the most serious of the Dec. 3 complaints against the police – to be brought, the IPCC must complete its investigation within six months. Whilst the IPCC was prompt in interviewing the students making the complaint, it failed to interview any of the accused officers in time. Shortly before the six-month deadline, the complainants’ lawyer discovered that assault charges against the officers were off the table, since the IPCC had not interviewed them in time. Furthermore, the law prevents the students from launching a private prosecution. Apparently, the main reason for the delay was that the IPCC suspended the investigation whilst the trial of those arrested on Dec. 3 continued. The reason the IPCC gave for the suspension was that it didn’t want to ‘prejudice the outcome of the trial’. The reverse was apparently not considered true: namely, the trial wasn’t considered prejudicing to the IPCC investigation. Whilst the IPCC can still recommend internal disciplinary proceedings on the part of West Midlands Police, the opportunity for a criminal conviction of the officers involved is slipping away. The IPCC has previously been the subject of criticism from several quarters, including Parliament. The delays, obstruction and frustration that has resulted from the IPCC proceedings contrast sharply with the punishments smoothly meted out to the two activists convicted over their actions on Dec. 3, Luke and Alistair. Collectively, the pair received a total of £1,810 in fines, and 200 hours of unpaid work. The joint reaction against WFFE from the University and police is perhaps best exemplified by a tale yet to be made public, until now. On Aug. 12, Luke Dukinfield, the 19 year old Chemistry student convicted under Section 4 of the Public Order Act 1986, was completing their community service at the Salvation Army near Leeds when they received an unexpected phone call from a West Midlands Police officer. The officer asked Luke to pass on information about the political groups they’re involved with. The officer explicitly mentioned protests that Luke had attended with WFFE, and asked for information on the tactics and targets of activists. Luke refused. “They basically wanted to get into the mind of an activist – to know their enemy,” Luke says. Such attempts to persuade student activists to inform on their friends have occurred before. The Guardian revealed a similar attempt to infiltrate Defend Education Cambridge in 2013. This move suggests the authorities view hard-line student groups like WFFE as a serious threat. British police maintains a database of 9,000 “domestic extremists,” many of them radical environmentalists and anti-capitalists. The Guardian reported that the police use “undercover police, paid informants and intercepts” to target these “extremists”. This wasn’t the first such encounter Luke has had with the police. 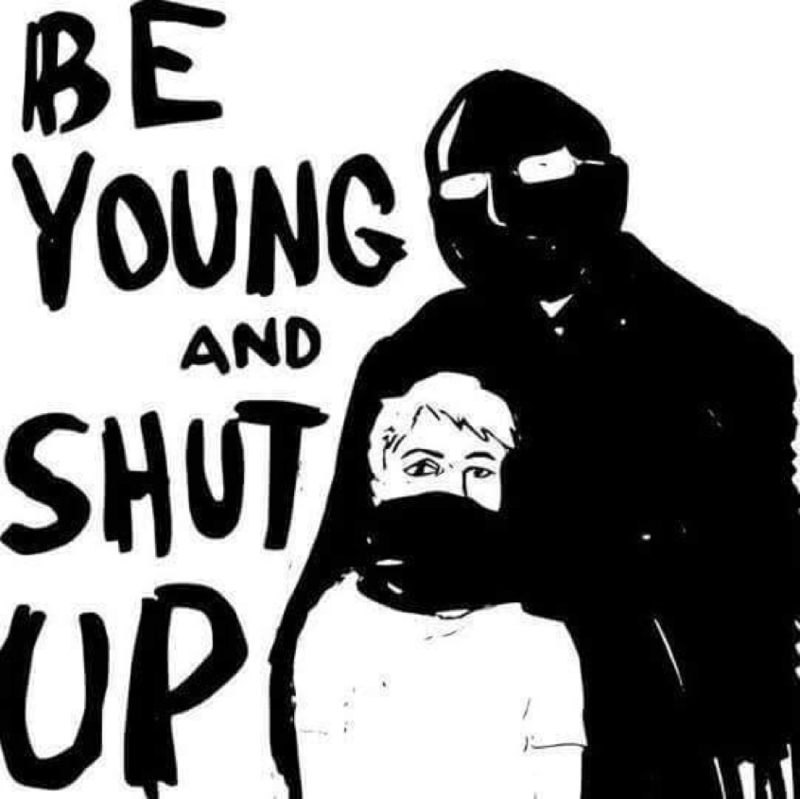 At an anti-fascist demonstration in Coventry last May, Luke was encircled by police officers shortly before reaching the crowd, warned that “we know who you are,” and threatened with arrest. Activist have long claimed that such tactics are commonly used by the state to attempt to shut down radical and effective protest groups. To WFFE’s north, Defend Education Birmingham were more-or-less crumbling during this time, under an onslaught of injunctions, arrests and suspensions. “It created a climate of fear around protest,” remarks Hattie Craig, who was Vice President of Education at Birmingham’s Guild of Students during the assault. “Students are afraid to even take part in demonstrations, knowing that others have been put under disciplinary action just for attending them,” she continued. At Warwick, the events of Dec. 3 seem so far to have had the opposite effect. The impact of the images and footage, broadcast instantly to the laptops of thousands of students, appears to have initiated a wave of revolt against the management of the University. “Dec. 3 not only heralded the arrival of the University of Warwick as an increasingly political space, but made a dramatic change to student politics and attitudes towards activism on campus,” says Rosie Hiscock, at the time a sympathetic observer of student activism, and final year English Literature student. “Those who may have never considered themselves activists stood alongside the handful who have been dedicated to the campaign for a while,” she went on. In the 1970s, our University earned the name “Red Warwick” on account of its radical student body, militant protests and presence in the national student movement. Everything from the fight for a permanent Union building to anti-apartheid activism was seen on campus. In recent years, that reputation has been all but lost. The 2014/15 academic year might be remembered as Red Warwick’s rebirth. WFFE would later join forces with the staff union, UCU, to fight – and ultimately defeat – a proposed postgraduate teaching casualisation scheme, TeachHigher. Staff and students feared the programme would weaken protections for postgraduate teachers and drive down wages. Fossil Free Warwick University, part of the international environmental movement to break the power of the fossil fuel industry, succeeded – to widespread surprise – in getting the University to commit to stop investing in coal, oil and gas companies. Several activists on campus have argued that the presence of the hard-line, radical WFFE helped Fossil Free Warwick win, by forcing the administration to grant concessions to more moderate campaigns. For many of the individuals involved in Dec. 3, the events deepened their political commitment and radicalism. The views of most of those interviewed for this piece on direct action, the role of the police, and authority in general have shifted to a more anti-establishment position as a result of the year’s events. “To have felt the violence of the police first hand, makes you realise what it’s like to be part of targeted groups like ethnic minorities, who face that every single day. And it really makes your yearning for a world free from oppression and inequality much stronger,” says Miguel Costa Matos. “When we were outside [Senate House], I felt like we’d transformed as a group within seconds, into a group that really understood more about what was going on in the world, and … there was just a kind of layer of the fear that had gone,” says Jonathon Pitt. Whilst harsh individual impacts would be felt in the coming months, as a group, WFFE coalesced into a force on campus that hadn’t been seen at Warwick for years. Warwick For Free Education was forged in the Senate House foyer that evening. Many of its members are on their way to becoming prominent activists in the national student movement. Admired by many, hated by others, feared by some – one thing that these events have shown is the organisation’s ability to withstand unrelenting pressure from the authorities. What this year will bring for them, time will tell. More content and analysis on Dec. 3 and the surrounding events will be released on the Warwick Globalist’s website and print editions in the coming months. 1. Centre for Human Rights in Practice (2015), ‘Final Report on the Future of Protest’, p.3. 2. Centre for Human Rights in Practice (2015), ‘Warwick Summit on Protest Survey Responses’, p.52-53. 4. Centre for Human Rights in Practice, ‘Final Report’, p.4. 6. Home Affairs Committee, ‘Independent Police Complaints Commission’ (Eleventh Report, Session 2012-13, HC 494), p.4. 7. IPCC, ‘Police Complaints: Statistics for England and Wales 2013/14 and 2012/13’, P.6.